How High the Moon... in Sweden? The Earliest LSLP Yet? 970xxx, First Series, Les Paul Standard w/Crown Inlay. Originally would have had the conventional features of the era for LP Stds. (Gold, P-90s, etc). The lowest serial number I have seen thus far. I have also seen a 972xxx & 975xxx example with similar features. All of these serials are very close to each other, and I believe any one of them could have shipped before the others as such. Probably a June '68 guitar. 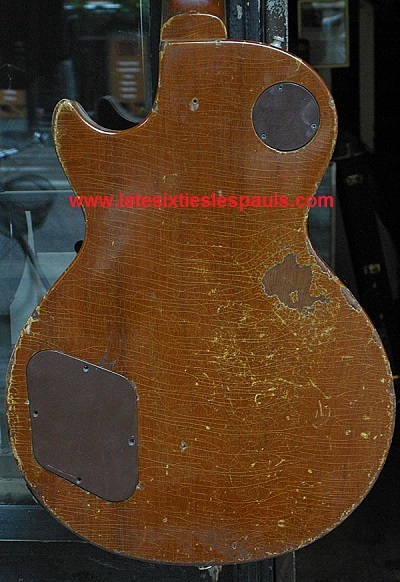 Make sure to read Nysse's story below, he even sold a 1960 Les Paul Standard to get this guitar back after he sold it at one point. Fun stuff! Shaved neck (orig finish saved on headstock front and back), old Sunburst refin (orig finish on body back and sides), humbuckers, Grovers, Non-Original Truss Rod Cover, and Bigsby. From Nysse himself: "it’s Joe Walsh autograph on the guitar. Joe have been my Guitar Hero since 81 and I met him 1992 in Gothenburg and he sign my guitar and ask me three times if I was serious that I wanted his autograph on a vintage Les Paul and I told him 'Yes I Never Gonna Sell That Guitar And You Are My Hero' and he signed it." NOTE: Nysse was kind enough to donate his story and pictures to this site. I felt it was important to post his story verbatim as he sent it to me. English is not his first language, so please be respectful of that. "Hi!, I like your site Late Sixties Les Paul. I bought one of them in 1977, with a 68 with Crown inlay, Mine bears a very early serial number 970xxx. [EDIT: Precise number redacted] I have a guitarshop in Stockholm Sweden and I have worked as a historican for Gibson over here and had a lot of contact with Walter Carter at Gibson ten years ago. I asked him about my Les Paul why it had the Crown inlay and he told me it was because Gibson didn’t had a contract with Les Paul when they start making them again and that’s why it has the Crown inlay. After Namm show summer 1968 Gibson made it up with Les Paul and he told me that most of the Crown inlay Les Paul were shipped outside US. 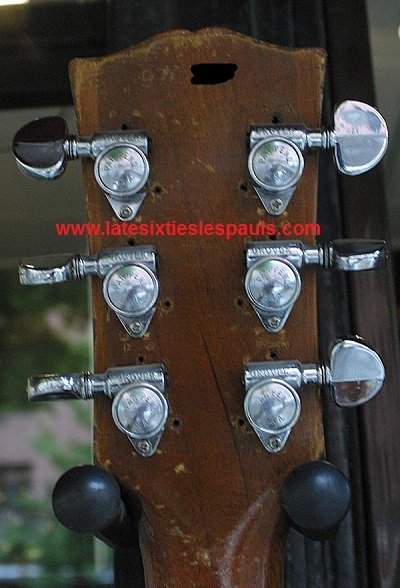 I have seen five guitars here in Sweden with Crown inlay only two of them were original finish with P-90:s and only one of them had original tuners. The other two is like mine refinished sunburst with humbuckers, I have seen them in England and Germany to, one of them is in the Gibson Les Paul Book by Bacon and Day." "Walter told me that mine had a very low serialnumber and must be one of the first ones that was made." "I have the whole story (if you wanna hear it) how it comes up like this the only owner I don’t know is the first one, my hero Joe Walsh signed it 1992 in Gothenburg." Sten a friend of mine were playing with a band in Lulea up in the very North of Sweden120 km from the Arctic Circle 1975. He saw an ad in the local paper that someone sold a Gibson Les Paul (Les Paul were very unusual at that time in Sweden) and called the guy who lived close to the hotel so Sten walked over and had a look on the guitar and bought for 1500 SKR (250 dollars today’s money) He came home with the guitar and called another friend of mine Johan (he was the Gibson guy at that time) and told him he had bought a Les Paul and Johan go crazy and told Sten to come over and he did, they looked at the guitar and Sten said he liked it but he didn’t like the pick ups and Johan told him I have humbuckers and a chisel so they change pickups on the guitar. Sten didn’t like the guitar because the neck was to thick so Johan bought the guitar from Sten and Johan looked at the guitar and find out that Goldtop wasn’t his thing he wanted it Sunburst and Johan were a painter so he took lye strong goo that took away the paint (no sanding) and did the sunburst that still is on the guitar on his kitchen table. Johan had the guitar for a while but he also think that the neck were to thick so he sold the guitar to another friend of mine Chino who were a famous guitar player over here in the mid seventies. Chino also didn’t like that fat neck and he had a lot of money so he took the guitar to another friend of min Goran a guitar tailor and asked him if he could make the neck thinner, Goran said he could but he must have a guitar neck that Chino like to copy it and Chino took his 1961 Gibson ES-335 (Gibson had thin necks 1960-62) to his workshop and Goran make the neck exactly like the 335 neck, he change the plastic saddles on the tune o matic to metal, he also vanished the top and repainted the neck with cellulose, he put on two original Gibson P.A.F. pick ups, one of them were a 1959 cream P.A.F. So the guitar became a killer but Chino think that the guitar lose the tone when he had make the neck thinner so he decided to sell the guitar and that’s were I came in." My band broke up in April 1977 and a friend of mine from school took me into a band with an upcoming artist Magnus Uggla and he had made two albums and a third was ready, I start rehearsing 1/8 the 23 the same month he released a new single that made the whole thing he top all the charts and I was going on tour with Sweden best selling artist. At that time I played a Burny Les Paul and my friend from Scholl had a Gibson and he told me that I gonna go on tour and play a Burny no good you must have a Gibson. Only a week later he came to the rehearsal and asked me if I had heard the new record with Atlanta Ryhtm Section I said no, he said: they singing Good Trust In Gibson, have you ever heard anyone singing God Trust In Burny so I find out that I must have a Gibson, I sold my Burny and I called Johan and asked if he knew anyone who had a Gibson Les Paul for sale and he said yeah I gonna call Chino he have one." 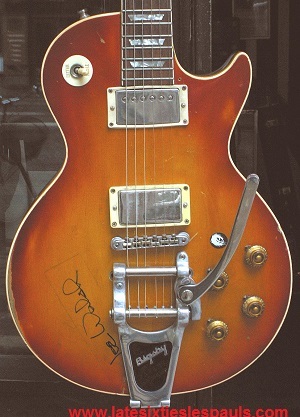 "Chino came to the guitar shop I worked in that I owns today and said I heard you looked for a Gibson Les Paul and he showed what he had and I tried it and was lost in that thin neck I bought it for $1000- (today’s money) and I thought it was a 50 this Les Paul because it had Single piece Neck and Single piece body so I was happy until I meet Goran the Tailor guy who told me it wasn’t because it had a fat binding in the cutaway and it should say Les Paul on the Headstock he had never seen a Crown inlay on a Les Paul before so I thought I was busted. I called Johan and told him that I had bought Chinos guitar and felt busted it might wasn’t a Gibson. Johan told me that that guitar is a Gibson and he told me the story about Sten him and the guitar and he told me that it might be a 68 or 69 model because he had seen one brand new on Hagström and that one had the Crown Inlay, I trusted in Johan because he knew a lot about Gibson and later on I find out that it was a 1968 Les Paul. 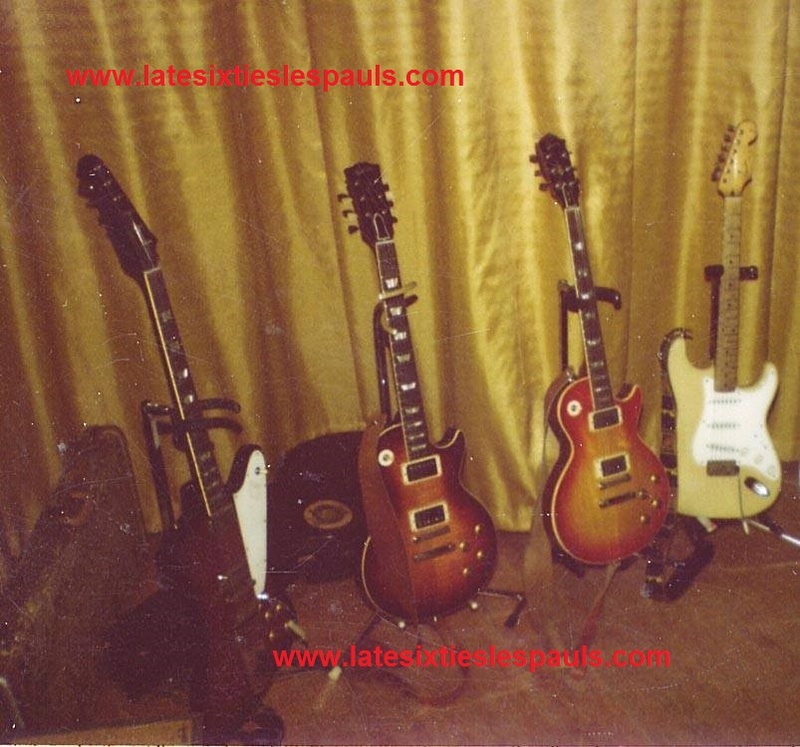 The first pic on my Les Paul site is from my first tour with Magnus 1977 note I have that cream P.A.F pick up that I sold for what I payed for the guitar in the beginning of the eighties today they are worth ten times more." "The backside of the body and the front and back on the headstock is original cellulose finish and the neck and the top is refinished with cellulose it was new painted when I bought the guitar and it was in good condition except for a big ding on the upper lower side on headstock, the black finish was gone, I put on the Bigsby ( ilove Les Pauls wit Bigsby), I have made it look as it is today after playing that guitar on tours 1977-2001. I have never been that kind of person who keeps something in good condition so thats why I never had bought a new guitar or car." "My Friend Ernie refreted the guitar 15 years ago and routed the pick up cavities so it looks good he also glued the fretboard that was lose from the neck. What I like with that guitar is that I know the whole story about it and so many friends have been involves in it." "To be honest I sold my Dream Les Paul 1980 to a friend for $1100- with Bil Lawrence pick ups and bought a real 1960 sunburst lost in the flames for $4000-that Les Paul was a 1960 with a very low 60 serial number and neck was a 59 neck I couldn’t play that guitar I really hated the neck so I sold it and bought my Les Paul back 1982 for $1500- I lose $400- on that deal but I had no choice my friend didn’t wanna sell it back so I gave him an offer, I must have the guitar back and that really learn me something, you know what you have but you don’t know what you get, that’s why I have lived with the same Lady for 36 years. 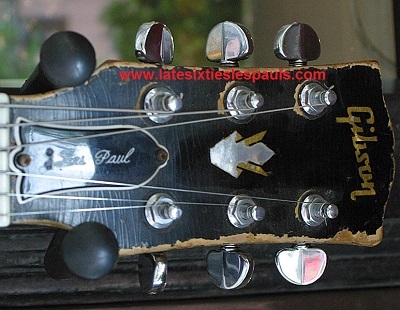 The other Les Paul was beautiful with the Flames but useless for me." "Here’s my guitars on tour 1981, I had loan my old Les Paul to find out what was wrong with the new one. My guitars on the road was a 1963 Gibson Firebird V, 1960 Gibson Les Paul sunburst (refinished by Goran), 1968 Gibson Les Paul, 1956 Fender Strat I didn’t like Fenders because of the 25.5 scale and I the sound was very hard on this guitar because of the maple neck and ash body ( Clapton wqas roght about his Blackie It had a 64 (alder) body and 57 (maple) neck but I had this fort the ballads I played with the band." Ahhh.... 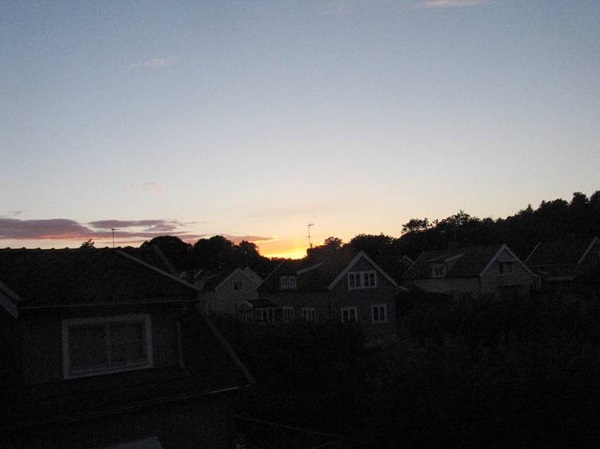 Midsummer in Sweden! 10:45pm.